Headaches, backaches and tightness galore... when you are tired of just coping and living with pain and discomfort go see the guru, Dr. Jing Liu. Dr. Liu is an Acupuncturist in Scottsdale AZ area and I can say from first hand experience that her hands and methods are healing and nothing short amazing. I suffer from chronic headaches and I hold a lot of tension in my back and shoulders. My hubby on the other hand is constantly banged up from work, its a part of the job. The lovely Dr. Liu took the time to figure out what our issues were and then she went to work. I have only had one session with Dr. Liu, my next service is already scheduled, but I already feel relief. She placed a few acupuncture needles to relieve my headache and then did hot cupping on my back to relieve my tension and tightness. The pictures look a little weird and scary but it didn't hurt at all, it actually felt good. 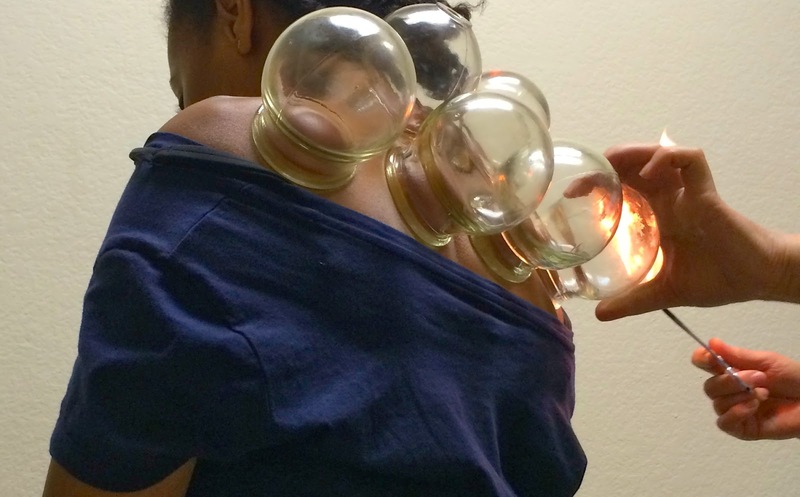 The best way that I can describe the feeling of the cupping is like a deep tissue massage. I am happy that we have been introduced to Dr. Liu and she has won over these Weeks… we are officially believers!